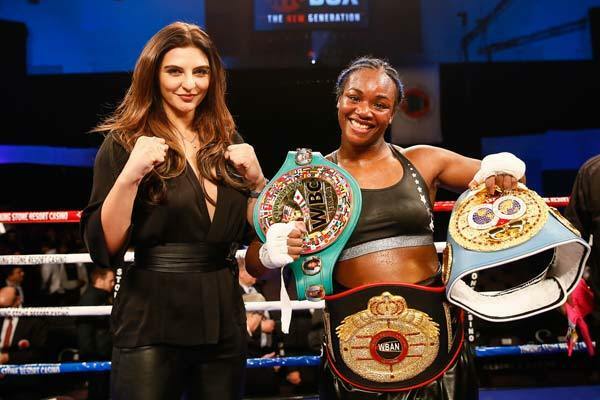 WBO middleweight champion Christina Hammer 24-0 (11) says she has gotten into the head of WBC, WBA and IBF champion Claressa Shields 8-0 (2) ahead of their unification clash at Ballroom in Boardwalk Hall in Atlantic City, New Jersey on Saturday night. The undefeated 28-year-old, who boxes out of Germany but was born in Kazakhstan, insists she knows everything Shields is likely to do in the ring. “I know everything about her, I’ve watched a lot of her fights and I was at a few of her fights ringside,” Hammer said to RingTV.com. Hammer, who will enjoy a three-inch height and reach advantage over Shields, believes her experience and technical skills will see her through. But it’s the mind games that may prove to be the most decisive factor of the fight. “I know how to provoke her and drive her crazy. I have to box her and use my technical skills, and my experience and round-for-round I have to be careful,” Hammer said. “I’m taller than her and my arms are longer, plus I have 24 fights. I’ve learned a lot from every fight, and I’m growing and growing from fight to fight. Distance and movement is a big deal for me, because I’ll know how to handle this.